This problem follows on from Mixing Paints. 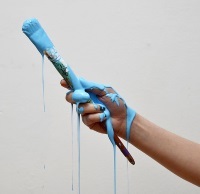 A decorator can buy blue paint from two manufacturers. She can mix the paints to produce different shades of blue. You may wish to experiment with the interactivity below. Is it always possible to combine two paints made up in the ratios $1:x$ and $1:y$ and turn them into paint made up in the ratio $a:b$ ? Experiment with a few more examples. Can you describe an efficient way of doing this? Chemistry. Music. Ratio. Similarity and congruence. Proof by contradiction. Calculating with decimals. Mathematical reasoning & proof. Area - triangles, quadrilaterals, compound shapes. Calculating with fractions. Converse of theorem and inverse.